It has been described as everything from Bhangra to folk to fusion. It's catchy with fervour, fresh yet traditional. It'll make you nostalgic and it'll make you dance. Playing in markets and restaurants, at parties and weddings, it has attracted folk music lovers and techno audiences alike. Songs from the depths of Bengal and Bangla music put to contemporary beats that draw listeners of all ages. Only about two months old, it is definitely a hit. If you've ever wondered about the man behind the recently released folk remix album Krishno, Habib is it. The 23-year-old Music and Audio Engineering graduate from London's School of Audio Engineering was born “surrounded by music” and started picking up tunes on his father's keyboard at the age of four or five. One would expect little less from the son of one of the country's popular singers, Ferdous Wahid. But Habib is definitely carving out his own niche in the field, and remixes are only the beginning. A Sylheti restaurant owner in London, Kaya had the deep Baul, and most importantly, new, fresh voice Habib was looking to feature in his folk remixes. “Kaya's a really fun-loving person and a huge music lover,” Habib says. “I heard him sing and he heard my tracks and agreed to do the vocals. We weren't even really serious at the beginning. 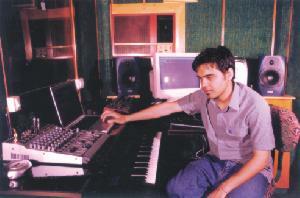 Only after a couple of the songs came out on a mixed pirated album about a year before Krishno's release and were a real hit did we take up the work seriously.” Judging from the huge crowd response in both Dhaka and London, their work has paid off and videos of the songs “Krishno” and “Kala” are already in the making. While Deshlai is due to be released in a couple of months, Habib's third project and first original featuring again, Julie, her brother, Warfaze vocalist Balam and two new voices, is already under way. “I'll consider my first product to be my original album,” he says. “So far, I've only worked with collected songs. Deep inside, I don't feel like my own identity has come out yet.” This one will feature a variety of music, ranging from pop to modern. So does the musician himself sing? Not professionally, as yet, but he does have a terrific recording of his own from the days back in London. He's not even sure if he'll feature the soft, nostalgic piece in his own CD if and when he ever ends up putting it together. “I don't push myself to meet any deadlines,” he says. “I work into late hours of the night in my studio just thinking up tunes as they come to me and then I work on them during the day. I don't know when I'll have my own CD out. Maybe I'll do two or three tracks a month, maybe one. When I have about ten, I might put them together as an album.” What he does aspire to bring to all his works is versatility, and in his own songs, he wants to bring in Arabian and Latin tunes, among others, with Bangla lyrics. Another exciting project up the pipeline is Dangerman, featuring father Ferdous Wahid in the lead character in a James Bond type action tele-film. The demo for the promotional is almost ready to go on air while Habib is working on the music for the whole film. “This is the first of its kind in Bangladesh,” says Wahid, “with bombs exploding and all that. And I haven't heard the likes of such music in my thirty-year career,” he adds, looking with appreciative pride towards his son. After bringing out a few more albums featuring some more new artistes, Habib wants to put together his own concert, with not only his own music but choreography, lighting, the works -- “Full entertainment!” as he describes it. “It's just going to be four or five artistes under one banner, singing for three or four hours. If I can get it together, I'm sure it'll be a success.” Regarding his plans for the future -- “I just want to produce good music and make people happy,” he says very simply.